When the Spellman family gets a new neighbor, Isabel Spellman cannot shake the feeling that something is off about him. Maybe it’s his all too common name of John Brown? Is it his office door that he constantly keeps locked? Or maybe it’s the fact that privacy and trust is something that is rarely present when it comes to the Spellmans. 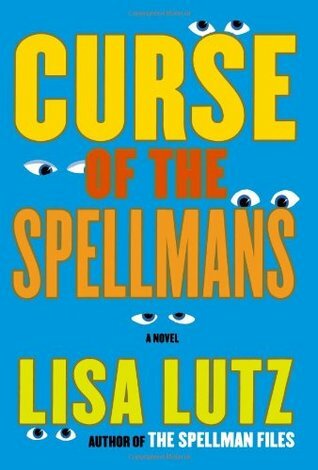 In Curse of The Spellmans, Isabel seems to be flirting with paranoia and everyone is under a microscope – her Mom, Dad, her sister Rae and even family friend Detective Henry Stone. When will it end and just how many times does Isabel need to be arrested? Guys, I love these Spellman books. Lisa Lutz’ dialogue-heavy novels about a quirky family of detectives are the definition of a page turner (I’m sorry for my overuse of this phrase). These are books where you tell yourself, “OK, just one more chapter” and before you know it, a hundred pages have passed since you sat down and picked up the book. In my review for the previous novel, I expressed some concern about the fact that Isabel seemed a bit disingenuous. However, that changed in this book. Lutz spends a lot of time on what makes Izzy tick and as a private investigator, her constant need for more and more information – something she just cannot control given that she’s been doing this the majority of her life. She felt more like a sympathetic character this time around. The rest of the Spellmans are in top form as well. Rae, Izzy’s younger sister, is just as enjoyable as ever and both Olivia and Albert (Mom and Dad) are on point. Lutz switched things up with David which produced some hilarious moments and scenes as well. The two mysteries were compelling although I had an idea early on in regards to who was vandalising poor Mrs. Chandler’s holiday lawn displays. When it came to John Brown’s strange behaviour, I had no clue what was going on. I felt blindsided at the end, but not in a bad way. Made total sense. Like The Spellman Files, Curse of the Spellmans is an easy, fun read that had me laughing out loud. There’s no sophomore slump here and I can assure you I’ll be finishing this series in no time.